Castizo in Spanish has a general meaning of “pure” or “genuine”. Madrid has a beautiful characteristic that may differ from other big cities and capitals of Europe. You may live in a metropolis but may sometimes feel like you’re in any regular town in Spain. Bodega de la Ardosa is one of many bars which has this feeling, and is one of my favourites. Located in the center of Chamberí, one of the epic castizo neighbourhoods of Madrid, Bodega de la Ardosa contrasts with its surrounding. 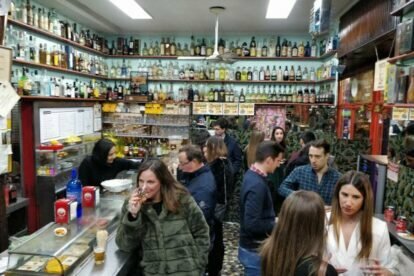 Located just beside Ponzano street, full of trending, hipster, booming bars, you’ll find this simple, old bar that’s still surviving the global gentrification. These bars are, simply put, in danger of extinction, so enjoy them while they’re still alive! Bodega de la Ardosa has a lot of personality, because of its untouched decoration, lousy style and familial staff. You’ll find people from the neighbourhood having the classic small caña accompanied with its small tapa. As the name Bodega implies, you can also buy a selection of wine they have on display in a cute corner. This place is like a museum for me. For example, one day I saw the owner use the TV to check the teletext to get informed about the last football results. I thought teletext didn’t exist anymore! If you go, please ask for the bathroom, you basically have to go under the bar and through their stockroom. Epic. Have one or two beers and enjoy travelling back in time.